The Papua New Guinea SP Hunters have claimed the 2017 Intrust Super Cup Minor Premiership after holding off spirited Wynnum Manly Seagulls 28 - 22 at the National Football Stadium in Port Moresby yesterday. A large crowd of well over 12 000 filled the fifteen thousand seat stadium to witness the Hunters historical win and the minor title. Prime Mininster Peter O'Neill presented the minor premiership title and medals to the players and congratulated the Hunters team and the management for a job well done. The Manly Seagulls came to Port Moresby to hurt the Hunters on their backyard and spoil the Hunters early aspiration for the Minor premierships title. With that determination, they sent Paora Kemp on the 7th minute for a unconverted try and took the early lead 4 - 0. The Hunters replied with a try on the 13th minute through Stargroth Amean. Captain Ase Boas added the extras and the home side was infront with 6-4 lead. In a physical game, both team threw everything in attack and defence to each other. 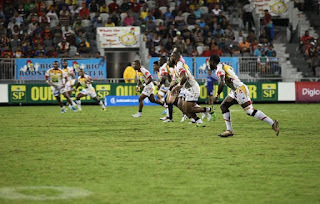 The visitors had an upper hand when Papua New Guinea Kumul Captain and Brisbane Broncos player, David Mead scored for the Seagulls on the 35th minute. Conversion was successful by Shaun Nona and the visitors led 10 - 6 into half-time. The second half began with the Hunters mounting huge pressure on the Seagulls. Hunters center Israel Eliab dived over the line to score the Hunter's second try. Boas missed the conversion and the score was squared at 10 all. In a physical encounter, the home side attacked the Seagulls line again. A nice ball off load from Watson to winger Abavu attracted Seagulls defenders and created a gap for forward Nixon Putt to dive over the line for the third try after a flip pass from Abavu. Boas found the uprights and the Hunters were leading with 16 - 10 with 20 minutes on the clock. The Seagulls replied with a try through Mitch Frei on the 59th minute to level the score again with 16 all. Hunters star player, Stargroth Amean scored his second try of the afternoon on the 63 minute to put his team ahead with 22 - 16 lead. This lead was further extended when captain Boas scored on the 68th minute and converted his own try to 28 - 16. The visitors regrouped and sent David Mead for his second try. Conversion was successful and the visitors trailed 22 - 28 . Hunters forward Stranton Albert was sin binned for elbowing and this inspired the Seagulls with more attacks on the Hunters line but the determined Hunters shut out the Manly Seagulls attack with solid defence in the dying minutes and held on to win the game 28 - 22 on full time.